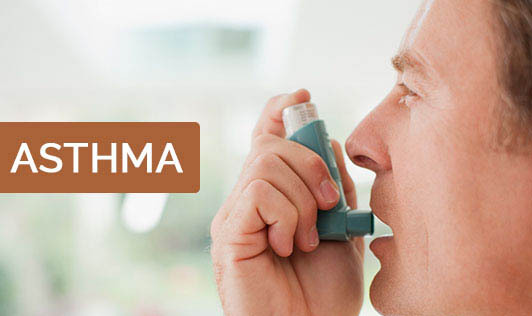 Asthma is a respiratory disorder that affects the lungs. It is one of the most common, severe and chronic illness that occurs during childhood. Asthma is a condition in which the airways carrying air to and fro to the lungs become swollen and sore. This swelling interrupts the normal breathing process blocking the airways and produces muscle tightening, swelling of the mucosa and production of thick mucus. It also leads to excessive coughing, wheezing, and tightness in the chest in children. In case of severe asthma the child can experience reduction in the supply of blood oxygen and shortness of breath. Severity of asthma differs from person to person. Generally children suffering from asthma are able to recover from the condition and its symptoms completely, until something causes another attack or episode. One of the popular causes of school absenteeism and hospitalization in children is said to be asthma. In the year 2003, children between the ages of 5 and 17 reported one asthma attack during the past year and happen to miss as many as 12.8 million days of school as a result of this dreadful condition. There is no specific cure for asthma. However it can certainly be controlled. To prevent asthma, the American lung association has dedicated and made prevention of childhood asthma the top priority. The child and the mother should gain enough understanding about asthma and asthma treatment which will ensure better control of the illness. Wheezing is closely linked to asthma, all the children suffering from asthma do not gasp. In the same way, children experiencing wheezing episodes cannot be concluded to be having asthma. Children will experience only one symptom of asthma at a time. This is because asthma symptoms are very similar to other illnesses and disorders. The doctor will usually take into consideration the recurrence of symptoms in addition to various other factors prior to diagnosing a child with asthma. Tobacco smoke inhaled during infancy can be a strong risk factor that can cause asthma during childhood. Ensure nobody smokes while the child is around. Tobacco smoke is also the greatest trigger for asthma attacks. Asthma is a respiratory disorder and affects the lungs. It is one of the most common, severe and chronic illness that occurs in childhood. Asthma is a condition in which the airways carrying air to and fro to the lungs become swollen and sore. This swelling interrupts the normal breathing process blocking the airways and produces muscle tightening, swelling of the mucus and produces thick mucus. It also leads to excessive coughing, wheezing and tightness in the chest in children. In case of severe asthma the child can experience reduction in the supply of blood oxygen and shortness in breath. The severity of asthma differs from person to person. Generally children suffering from asthma are able to recover from the condition and its symptoms completely, until something causes another attack or episode. One of the popular causes of school absenteeism and hospitalization in children is said to be asthma. In the year 2003, children between the age of 5 and 17 reported one asthma attack during the past year and happen to miss as many as 12.8 million days of school as a result of this dreadful asthma condition.